Quick to go in highly sought Stony Creek Ridge. 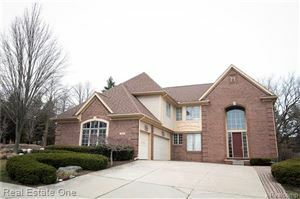 Custom 4 bedroom, 2.1 bathroom Colonial on a larger corner lot & with a 3 car garage! This home features an open kitchen with a walk-in pantry, wood floors, 2 way staircase leading up to the spacious bedrooms, bathrooms with dual vanities & Master Bath with jetted tub & separate shower. Grand, 2 story foyer and 2 story Great Room with large windows & cozy fireplace with 2nd story bridge overlooking the Great Room. Large Den features french doors. Newer furnace, roof, paint & carpet. Beautiful views from the patio of the large, professionally landscaped lot. HoA includes pool, tennis & clubhouse. Rochester schools.